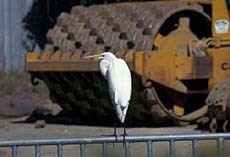 Urbanization not only affects habitat in obvious ways-for example, direct loss of habitat, channelization of streams, degradation of water quality, and dewatering of streams-but it can also affect habitat in more subtle ways by altering and disrupting ecosystem processes that can have unintended impacts to aquatic ecosystems through increased flooding, channel erosion, landslides, and aquatic habitat destruction. It is impossible to separate the overlapping and interrelated impacts of urbanization; however, the following broad categories are used to provide more detail. Friends of Corte Madera Creek Watershed addresses all of these issues in its work. Urbanization causes severe and permanent alteration of the natural vegetation when the vegetation is removed or converted to lawns and ornamental plants. In upland areas urbanization contributes to erosion and altered drainage, often reducing infiltration and increasing surface runoff. Impacts are particularly severe in riparian corridors, that under natural conditions are extremely rich in wildlife. Vegetation is commonly removed to increase the visibility of and access to streams and to allow the installation of landscaping and structures near the tops of stream banks. Loss of riparian vegetation reduces inputs of beneficial nutrients, recruitment of large woody debris, and stream-bank stability and increases the input of sediment and other pollutants in runoff by reducing the filtering effect of vegetation. It also leads to an increase in stream temperature by removing much of the overhead canopy. In spite of these impacts, what remains of our creek corridors constitutes a refuge for native trees and wildlife on the valley floor. Construction and landscaping near streams is often followed by the installation of retaining walls and other hard structures intended to protect or enlarge developed areas. 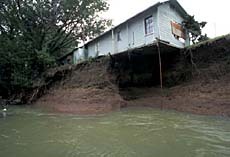 In downtown San Anselmo, buildings hang over San Anselmo Creek and foundations rest on the creek bed. 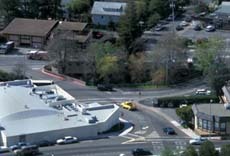 The course of Fairfax Creek was changed and it was buried in a culvert, apparently to provide more buildable area near the center of town. This results in severely constricted streams with disrupted or altered hydrological and riparian processes. Furthermore, in developed areas, much of the surface soil is covered by impervious surfaces (buildings, parking lots, roads), which increase peak flows and change channel characteristics. These changes increase the maximum discharge associated with floods and increase the frequency of flooding. 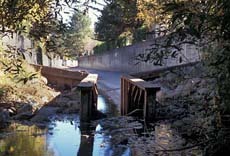 San Anselmo Creek, like many degraded urban streams, has a relatively uniform bed, with few pools or riffles, exposed near-vertical banks downcut by several yards, chronic high sediment loads, is deficient in woody debris, and has severely reduced numbers of aquatic organisms compared to nearby undeveloped streams. Clearing of vegetation, compaction of soil, installation of roads and other impervious surfaces, and direct interception of subsurface flows by drains damage watershed hydrology. Impervious areas increase winter peak flow and block infiltration into the soil. This results in a reduced groundwater storage and lower summer base flows. Urban non-point source pollution includes heavy metals, pesticides, bacteria, organics (oil and grease), dirt, and nutrients. In urbanized streams, the type and quantity of nutrients can change significantly. The important function of large woody debris and leafy detritus in providing nutrients in natural streams is taken over by excessive nutrient loading from sewage and runoff from roads and landscaped areas. The principal effect of excess nutrients upon a stream is the stimulation of algae and other aquatic plant growth, such as can be seen in the lower reaches of Corte Madera Creek during the spring and summer. Water quality testing in our watershed shows high concentrations of E. coli in some locations, especially in the summer. In tidal reaches, Enteroccocus concentrations do not meet the standard for water contact recreation. The San Francisco Bay Regional Water Quality Control Board has listed Corte Madera Creek as impaired because of high diazinon levels. In 1999, fish biologist Alice Rich placed thermographs at several locations in the creek. During the monitoring, which took place between March and September, she observed elevated temperatures throughout the watershed. The warmest water, which became lethal to young steelhead, was in the upstream end of the concrete flood control channel. Sleepy Hollow Creek had water temperatures during the summer that were generally satisfactory in shaded pools. Several habitat changes caused by urbanization can affect stream temperatures. Loss of riparian vegetation and increased channel width increase the area of unshaded stream surface area, and reduced water depths further contribute to heat loss or gain, increasing diurnal temperature fluctuations. Stream temperatures in urban areas may also be indirectly affected by changes in hydrology, channel morphology, and microclimate. Lower summer base flows resulting from reduced infiltration can also contribute to higher water temperatures. Urban development is characterized by high road densities, and the resulting bridges, culverts, and other structures constrain channels and impede fish migration in a variety of ways. The most significant barrier to passage for fish in our watershed is the concrete flood control channel in Kentfield and Ross. It is a velocity barrier for spawning steelhead at high flows because the resting pools are inadequate and it is a thermal barrier to smolts as they swim to the ocean. Other barriers include a very long culvert under downtown Fairfax and various poorly designed fish ladders, weirs, and small dams throughout the watershed. Areas of high temperature and poor water quality can also present barriers to passage. The abundance and diversity of aquatic organisms are greatly altered by urban impacts. The key to protecting and restoring urban streams appears to be reducing the imperviousness of surfaces associated with urban development, and protecting channel integrity and riparian vegetation. It has been observed that stream quality impairment is first observed when watershed imperviousness reaches 15% of the total watershed, and becomes severe at 30%. For stream ecosystems containing self-sustaining steelhead populations, some experts recommend that watershed imperviousness should not exceed 10%. At this level, creek flows are not radically changed, and minor pollutants can be filtered out by vegetation and soil. (The figure for the Corte Madera Creek watershed has not yet been determined.) Reducing the amount of runoff and minimizing landscape disturbance also can reduce urban impacts to habitat quality.